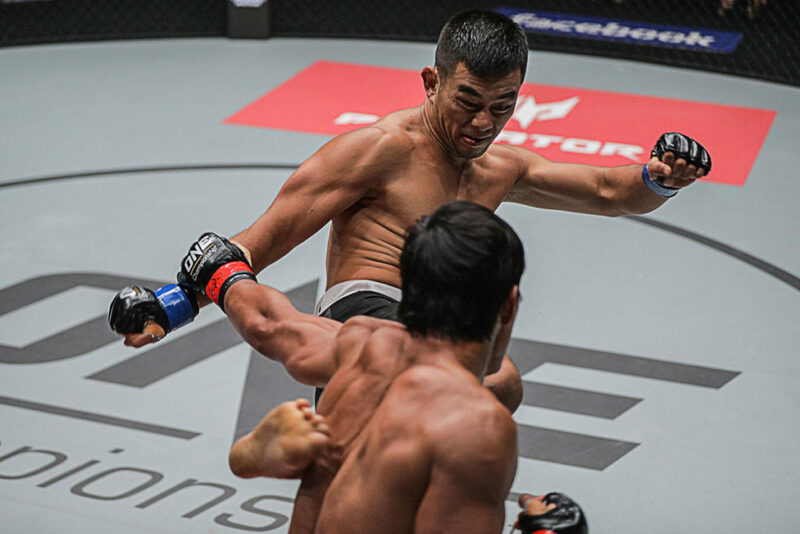 Malaysian-Kiwi martial arts superstar Ev “E.T.” Ting has re-created himself as a lightweight contender, and ever since moving up a weight class last year, he has been a force to be reckoned with. The 28-year-old standout from Auckland, New Zealand plans to continue his ascent up the lightweight ranks as he is set to duke it out with the returning Ariel “Tarzan” Sexton on the undercard of ONE: QUEST FOR GOLD, which takes place at the Thuwunna Indoor Stadium in Yangon, Myanmar on 23 February. Ting anticipates the highly-regarded contest against Sexton to be a grind, but he ultimately expects to leave the cage with his hand raised. “My last two bouts changed my whole mindset and attitude towards things. I am training smarter and looking after my health little more, so the blessing is to stay hungry, and keep pursuing what I am good at. I feel only good things are going to happen from here,” he said. After falling short in his bid to capture the ONE Lightweight World Championship against then-titleholder Eduard Folayang in April of last year, Ting bounced back by scoring a first-round technical knockout victory over former welterweight kingpin Nobutatsu Suzuki four months later. Ting’s quest to position himself for another title shot begins at ONE: QUEST FOR GOLD, where he faces a returning seasoned competitor in Sexton. Sexton, a Costa Rican based in Vancouver, Canada, is widely-considered one of the most skilled grapplers in the world of martial arts. With a black belt in Brazilian Jiu-Jitsu that he earned under the watchful eye of the legendary Renzo Gracie, Sexton boasts of eight submissions out of 10 total victories. Moreover, Sexton has three thrilling knockout wins to his name, stopping the likes of Roger Huerta and Peter Davis. Although he has been away from the limelight for nearly two years, Sexton’s last two wins came at the expense of Huerta and Eddie Ng. After carefully honing his skills in preparation for his next bout, Sexton is now ready to return to the ONE Championship cage to take on Ting. Even if Sexton appears to be a tough assignment for him, Ting stressed that his eagerness to continue winning keeps himself confident that he will have the victory over his Costa Rican counterpart. “He is only a human, and everyone is beatable. I always put that in my mind. That’s why I am confident and focused. I know on 23rd of February that I will prevail over Ariel Sexton,” he stated. “He is a tough guy, and most of his wins are by way of submission, so he is no joke. I am quite happy to be facing a lightweight like him and testing my skills against him. Obviously, he is a grappler, so if I wanted to be smart, I would stand and trade with him. But I am a little bit stubborn, so I may work for the takedown and go for the submission, and see where it goes,” Ting added. To prepare for his lightweight meeting with Sexton, Ting is incorporating many of the lessons from his three matches in 2017 into his current training camp. “Previously, I just wanted to cram in as much training and knowledge. But now, my eyes see it from another perspective. It is just about capitalizing on what you are really good at, and working towards a finish rather than exploring everywhere,” he explained. Ting has aced five of his six assignments versus top-caliber foes, with the sole loss of the six being against Folayang in his first world title tilt of his professional career. Ting might have stumbled in his bid to become the first Malaysian to win a world title in the sport last year, but the defeat has ultimately made him a smarter and wiser cage competitor. “If you are very smartly invested in your camp, and have the same consistent people drilling the same necessary things you need for your bout, then that is just being smart. You are looking after your body and making sure it is in its prime condition. I really just have a new attitude towards competing,” he assured. With a renewed desire to compete on the biggest stage of martial arts, Ting believes that a huge reward awaits him if he will walk away with the victory over Sexton at ONE: QUEST FOR GOLD. “I have had a switch of mindset since the title fight and am now more focused on myself as well as the tasks at hand. I feel that this bout is easily a worthy title contention bout. I am feeling strong and confident. I cannot wait to test my skills against another true contender in the division. The best is yet to come,” he ended.